Wow. 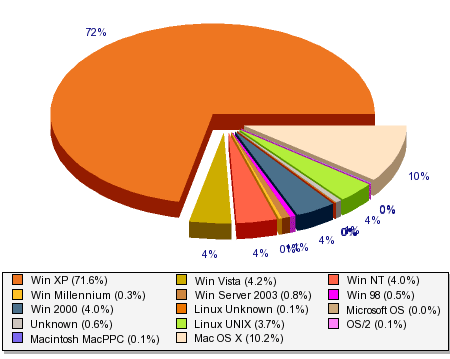 Linux and Windows freakin' 2000 are as popular as Vista among your readers. Re: your own computers, ditch Microsoft now and switch to an easy Linux distro like Ubuntu. It's not just for geeks anymore. How do you know the operating systems of the visitors? Howâ€™s the sound? King Crimson-esque? "Robert Fripp worked at Microsoft's studios to record new sounds and atmospheres for Windows Vista." Stat counters can detect what OS visitors can use, as well as which browser. elambend, I was going to show you a link to a page that repeats back what your browser is saying about you. But typepad's overzealous spam filter wouldn't allow it. Do a google search for "your browser tells" and click the first link. To make a long story short, your browser sends the information with every request for a web page. Ok, who is the guy using OS/2? Seriously, change is usually a good thing. For the record - the new Office interface is amazing. It takes a little time to get used to, but well worth the effort. I've been using Vista for awhile, and if it wasn't on a Tablet I would switch back to XP. Just goes to show that Coyote readers are "smarter than the average bear". Chris, what is it about Vista Tablet that you can't switch to XP Tablet?